Home › AIR GUNS › AIR PISTOLS › AIR PISTOLS HATSAN › Air pistol Hatsan AT-P1 6.35 mm. Air pistol Hatsan AT-P1 6.35 mm. 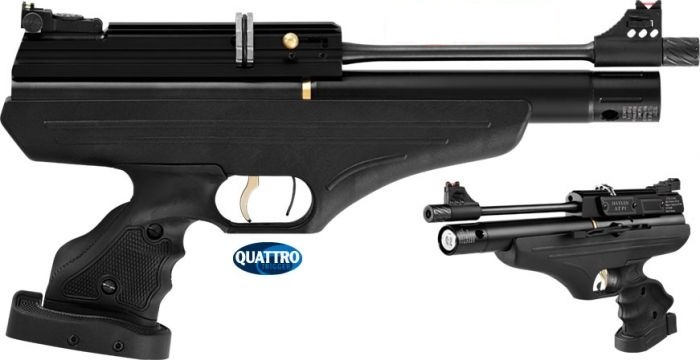 9 - shot, manual loading, side lever action, pre-charged pneumatic (PCP) air pistol. -Includes quick-fill nozzle & air cylinder discharging cap supplied in the box. -Overall blued finish, black anodized receiver. -Quattro Trigger: 2-stage fully adjustable match trigger for trigger travel and trigger load. -Dovetail grooved receiver for both 11mm and 22mm scope mounts.